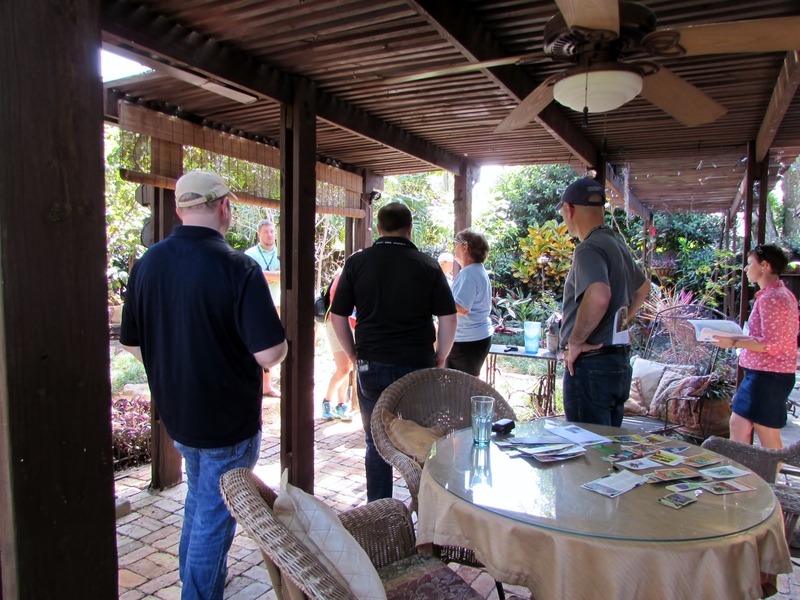 One the second day of the Association of Professional Landscape Designer 2014 International Conference we took two large buses out to tour homes in the Orlando area. We started in a neighborhood that was developed in 1924, during the Florida Land Boom days, when Walter Rose’s Central Florida Development Company launched its sixth development called Orwin Manor. The name ‘Orwin’ is a combination of Orlando and Winter Park. Walter Rose born in Athens Georgia in 1888 was known as an energetic, farsighted, innovative individual. He served Orange County and Florida as state senator from 1932-1949. He retired in 1949 after serving a term as senate president in 1943. 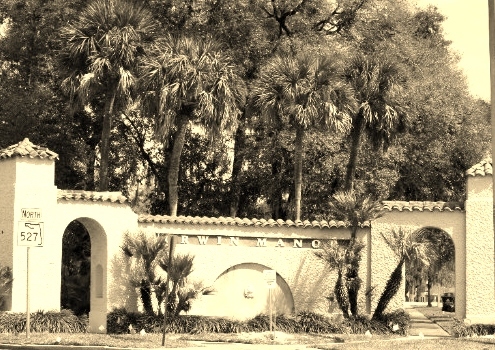 The homes in Orwin Manor are Mediterranean themed styles which was a prominent style in Florida’s great 1920’s land boom. 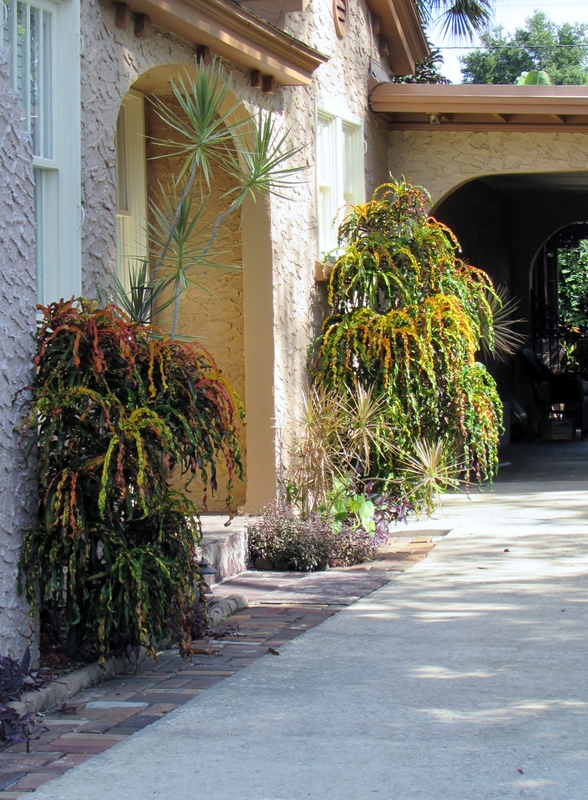 The streets of Orwin Manor, marketed as ‘The Great White Way’ were lined with curbs, sidewalks, streetlights with underground wiring, oak trees and palms. 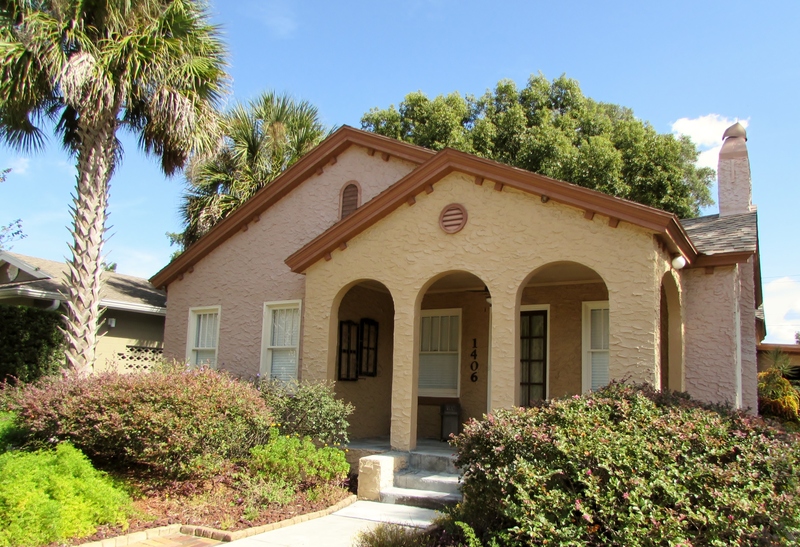 This 1935 Bungalow had a hidden treasure when the owner, Debra Ousley JD, bought it in 1990. She found hundreds of street bricks buried in her backyard. The previous owner had rescued them when the streets were asphalted over in the 1950’s when brick streets were thought to be passé’. Debra decided she would like to use the old brick in her landscaping and hired local teenagers to clean them up. You can see the brick along the side of the drive. And as edging in the front garden. 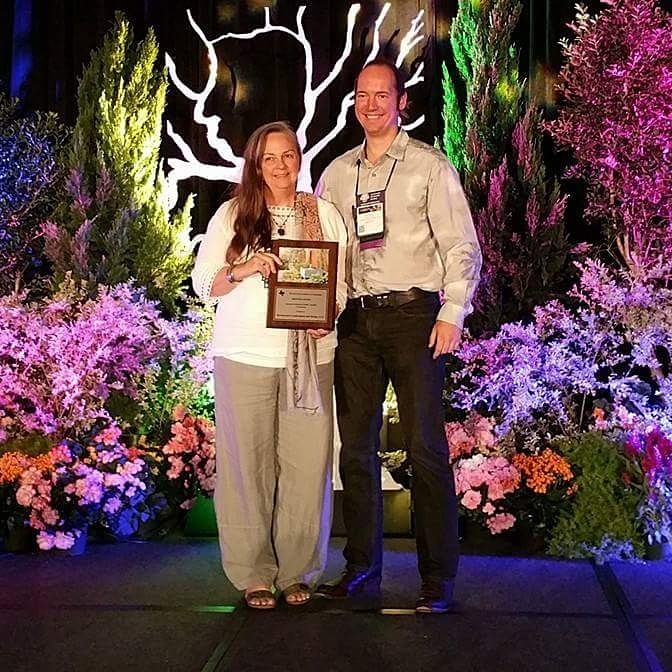 Debra is a Landscape Architect who became increasingly interested in sustainable environments. She went back to school and became an Environmental Lawyer. 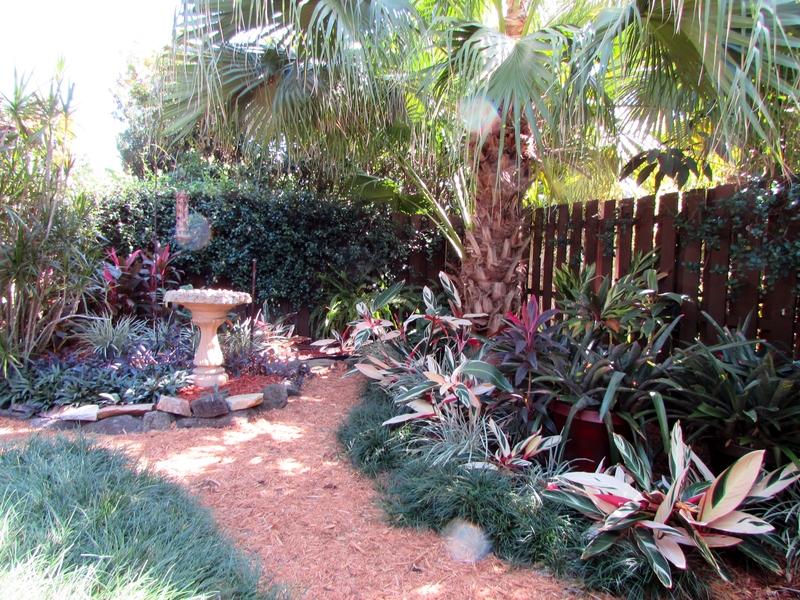 One of the goals she had in doing her landscaping was to be an example of low water-use and sustainability. She has 2 underground cisterns in the rear yard that can hold rainwater. No lawn in the front. You can see the change in elevation that helps with drainage for the plants. She used the soil left over from the excavation to create berms. 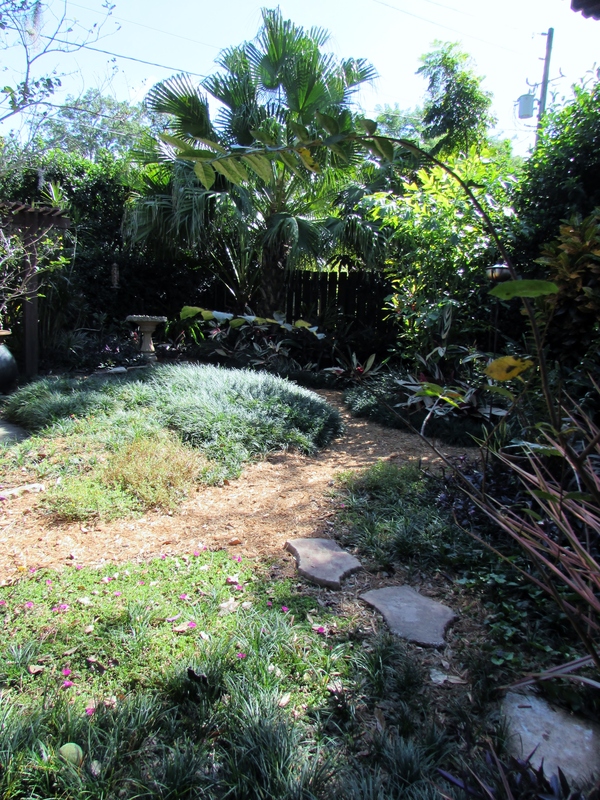 These raised areas work well for drought-tolerant plants that need good drainage. Debra has drip hoses throughout the garden but only uses them when it has not rained significantly for a few week. She is currently working on a book on low water-landscaping for Florida. 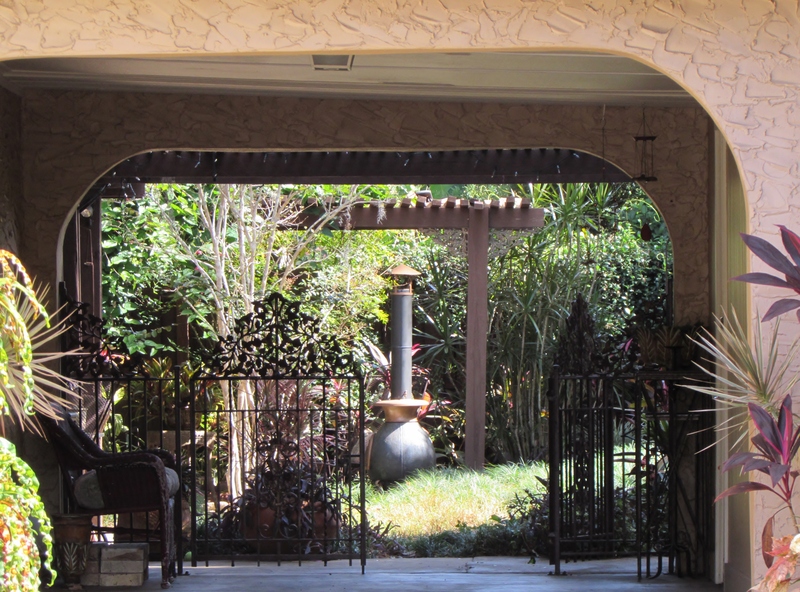 At the end of the driveway a lovely porte cochere leads to the back garden. This open area is a combination of low water need ground covers and path made of pine needles. Just off the house is a covered patio where Debra often sits to work. 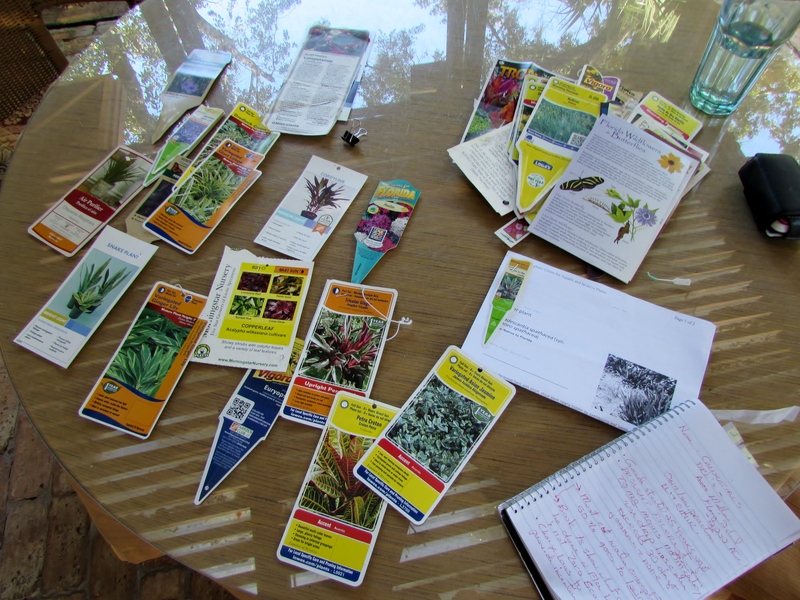 Debra is documenting the progress of each plant in her garden as research for her book. Orlando is zone 9 and has a very similar climate to Houston. It averages 48 inches of rain per year and can have hard freezes with lows in the 20’s. Florida has long hot humid summers similar to ours. 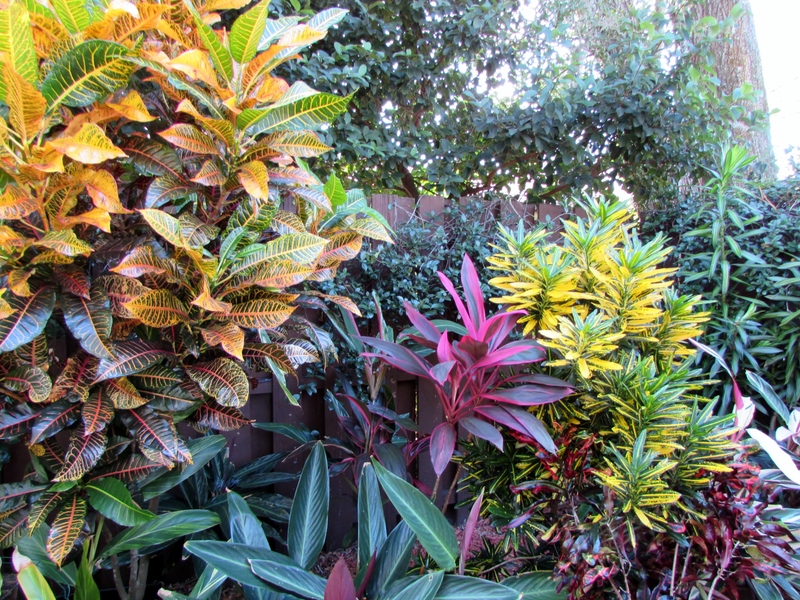 But it is not the heat that typically determines whether a plant will thrive in Florida, it’s the cold. For example, in July the normal high temperature in much of Florida is somewhere between 86 and 91 degrees. However, the January low temperatures vary greatly between Orlando and Miami to the south. Miami’s average low temperature is 32. This mean tropical plants thrive much better there. A soft curing path leads your around and through the garden. 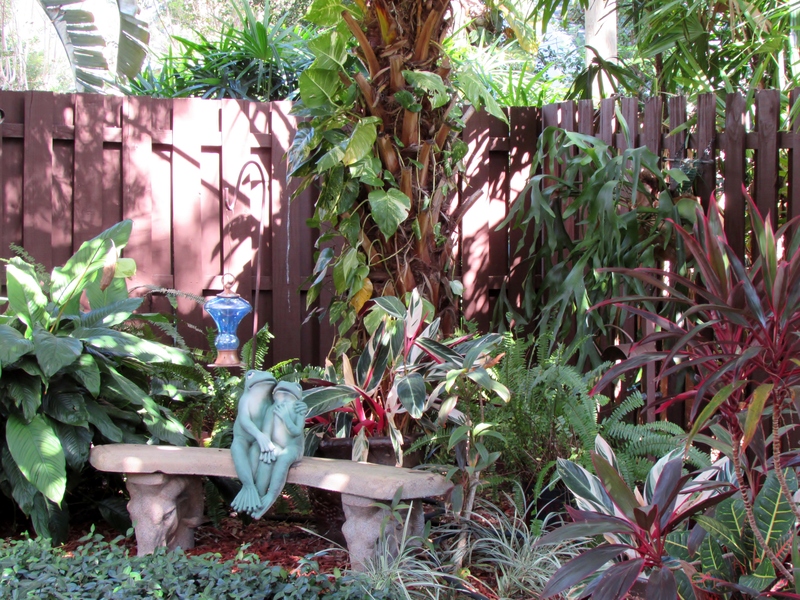 You can see Debra uses many types of bromeliads in her garden. 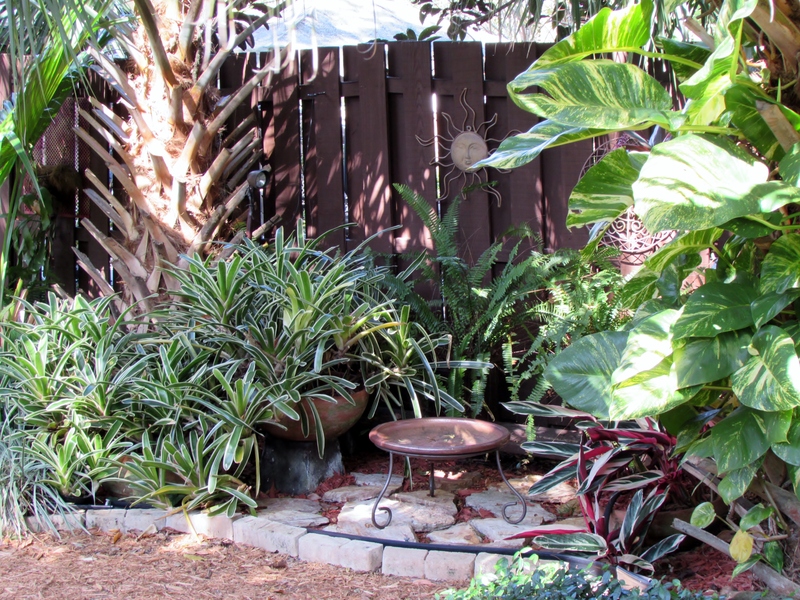 Bromeliads are tropical plants, but some are more cold tolerant than others and can be planted in the ground in central Florida. Many varieties are capable of surviving through temperatures in the low 20’s. I did not get a chance to ask her if she covers any of her plants. I have many of the same varieties and I keep them in a sheltered corner of my garden. If you’re ever in doubt about the hardiness of your bromeliads, cover them with a layer of frost cloth or a blanket to help protect them. 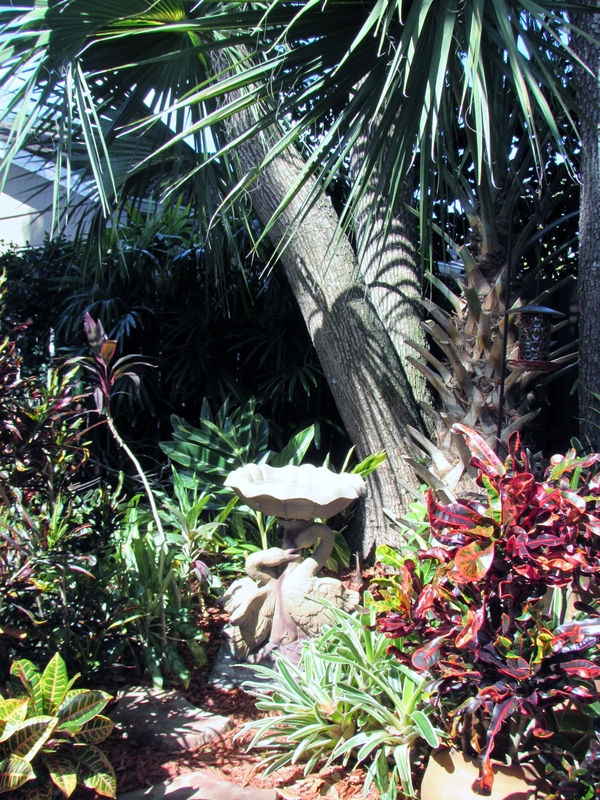 A nice tropical vignette with a water source for wildlife. 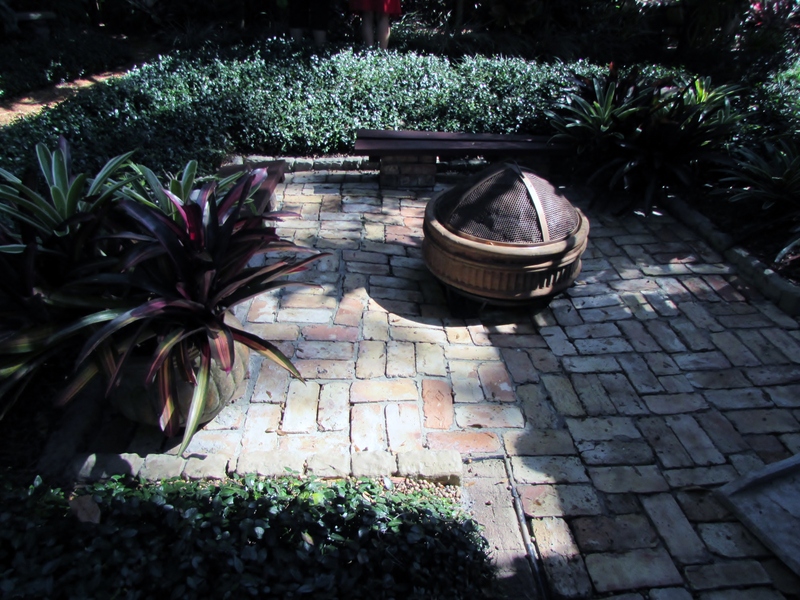 Here is a conversation area made using the old brick. 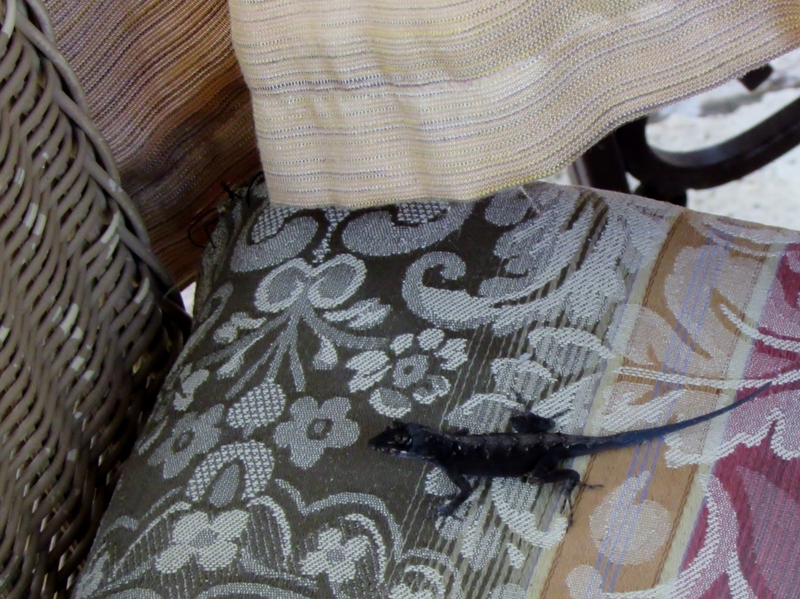 I little lizard on the patio chair. I am not sure that everyone knows what we mean by the word Sustainable. I have borrowed the list below from Ginny Stibolts who wrote the book Sustainable Gardening for Florida. I like this book even though it is Florida specific because most of the information works here on the Gulf Coast of Texas. These principles mirror what Debra talked about implementing in her garden. Having minimal impact on the environment, including reducing our use of gas-powered equipment, reducing or eliminating the use of toxic chemicals (pesticide, herbicide, and fertilizer). Making the best use of available resources includes harvesting rainwater and arranging our gardens to make the best use of this water, composting yard and kitchen waste and using it to maintain healthy soil, and mulching to prevent soil erosion and preserve soil moisture. 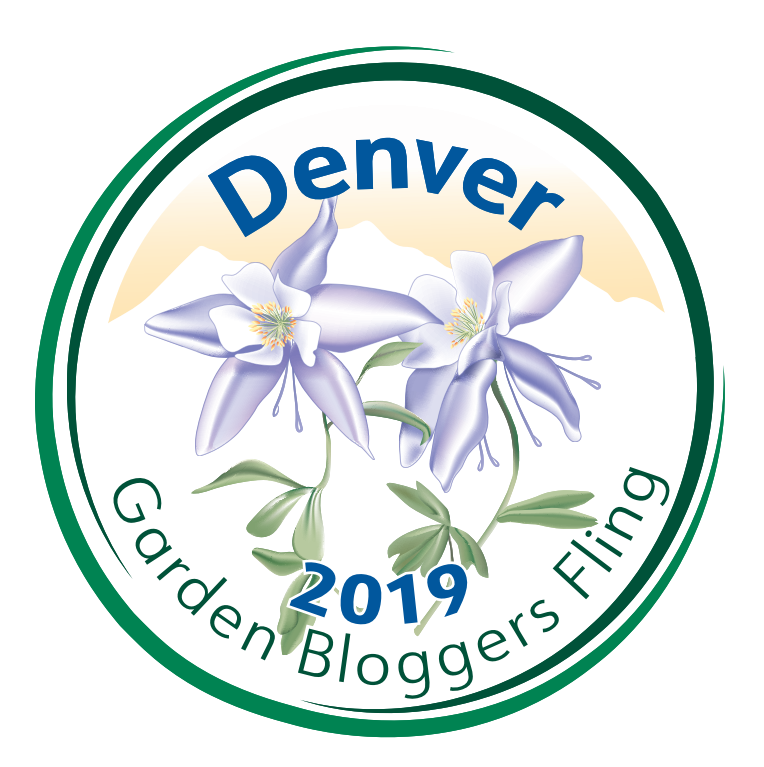 Saving time and money by putting plants in the right place, reducing the size of your lawn, and managing what’s left in a more natural manner. Reducing carbon dioxide and increasing available oxygen by increasing the amount of vegetation, especially large trees and shrubs. Offsetting some of the heat that is stored in buildings and roads by increasing the amount of vegetation. 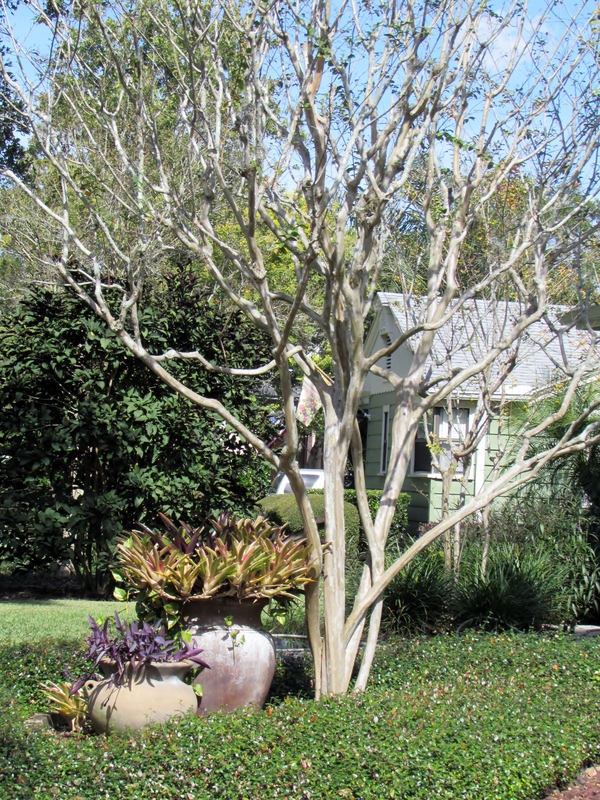 Trees, shrubs, and understory perennials, through the process of transpiration, can cool the area around them and lessen the impact of all the heat radiating from our rooftops and roadways. Increasing habitat for wildlife. A sustainable landscape is created when it supports a diversity of plants, birds, pollinators, butterflies, amphibians, and soil biota which all work together in a vibrant ecosystem. That’s a great list for describing sustainable gardening. 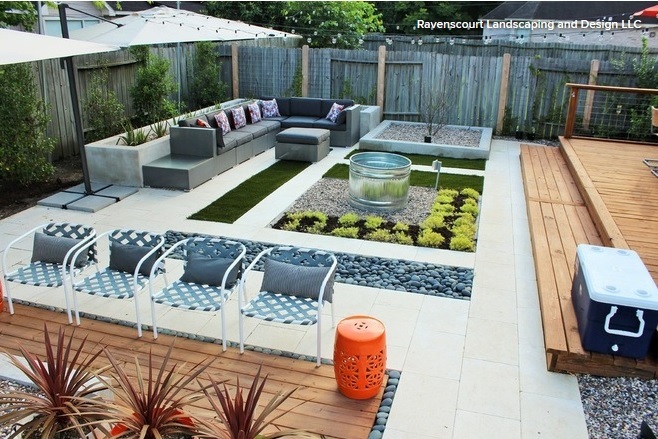 I love the inclusion of reducing the heat island effect through vegetation. I’ve been really interested in using more cold hardy bromiliads for my shade garden. 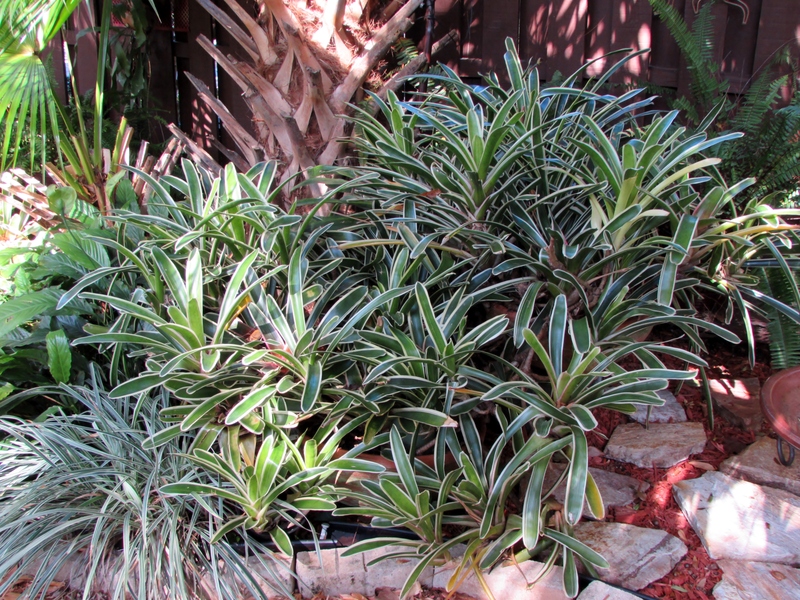 Most shade plants are adapted to use a lot of water but bromiliads kind of break that rule. Thank you Debra! A while back a friend of a friend gave me bromeliads he collected in Mexico and had been growing for years, those I know will be fine. I am trying some other too. They are such cool plants and need little attention!